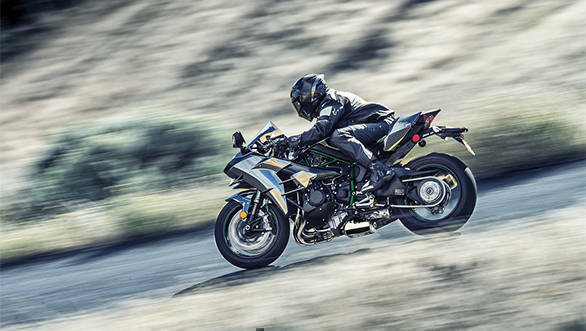 India Kawasaki Motors (IKM) has launched the updated 2019 Kawasaki Ninja H2 range in India with the H2 priced at Rs 34.5 lakh, the Ninja H2 Carbon at Rs 41 lakh and the flagship Ninja H2R at Rs 72 lakh (all prices ex-showroom). The most notable change to the 2019 Kawasaki Ninja H2 is that it now receives a 21PS power bump with output at 231PS. In addition, the 2019 H2 also features a new TFT colour display along with smartphone connectivity through its Rideology app which records ride data using GPS. There also new brakes in the Brembo Stylema monobloc calipers which replace the M50 from the outgoing model. The H2 also sports a new self-healing paint job as well as Bridgestone Battlax RS11 tyres. Bookings for the three supercharged motorcycles will begin on September 1, 2018 across the country, and will end by October 31. The deliveries will subsequently take place over the period of a year. 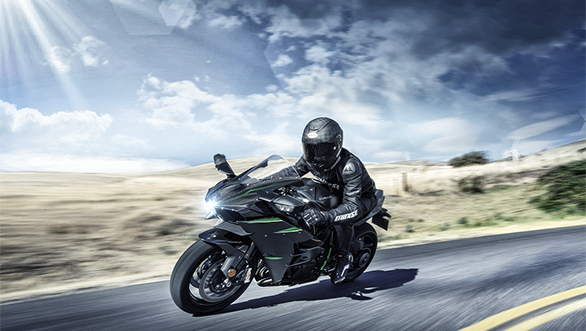 India Kawasaki launches a range of hypersport bikes of MY19 in India. 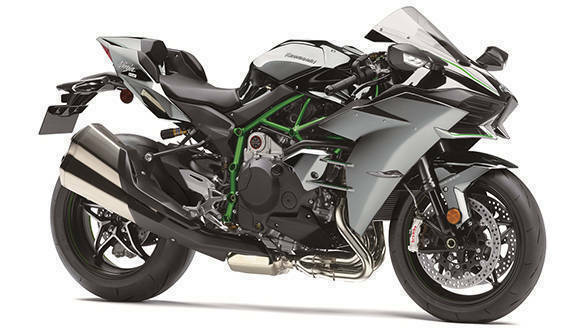 The range includes new Ninja H2, Ninja H2 Carbon and Ninja H2R. Known for "Built Beyond Belief", all these three models have already received numerous accolades in India. Kawasaki's most powerful street models already have plenty of innovations which are complemented only by the highest quality components. The MY19 models have some key updates in which the most noticing update is the increase in maximum power to 231 PS in the Ninja H2. 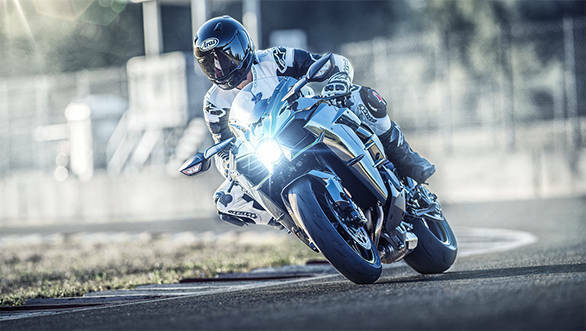 In the recently held Bonneville Speed Week motorsports an independent team made up of Kawasaki engineers succeeded in setting a world speed record of 209.442 mph (337.064 km/h) on the Kawasaki flagship Ninja H2 in the P-PB 1000 class. On the occasion of the launch Mr. Yutaka Yamashita, Managing Director of India Kawasaki Motors Pvt. Ltd, said "Our Ninja H2 range has an elegant artwork & profound engineering supported by advance technology. When it was launched in India 2016, the response was stunning. I hope we receive the same response from the market especially to the new Ninja H2 which has lofty performance." Apart from the increase in maximum power, the new Ninja H2 now has new TFT colour instrumentation along with smartphone connectivity to enable riders connect to their motorcycle wirelessly. Using the smartphone application "RIDEOLOGY THE APP," a number of instrument functions such as vehicle info, riding log, telephone notice, general settings etc. can be accessed. When riding (with the app ON), the bike and smartphone are always connected. Once the engine is turned off, or the smartphone is out of range (approximately 20 m) of the instrument's Bluetooth chip, the latest riding information is stored by the app and may be viewed on the smartphone. In case of brake, MY19 model is fitted with Brembo's Stylema monobloc calipers which are the company's latest high-spec street-use calipers. Compared to the previous M50 units, the new calipers have less volume around the pistons and brake pads. This reduces the internal space taken up by brake fluid, enabling a more direct response. In addition to all the updates, the new Ninja H2 also features Kawasaki's new Highly Durable paint with a special coat that allows scratches to repair themselves, enabling the paint to maintain its high-quality finish. While in some cases the recovery will require one week, in some cases the paint will not recover if the scratches caused by a coin or key, or zip fasteners. For improved handling new Bridgestone RS11 sport tyres have been added. Besides, all the lighting equipment (headlamp, position lamps, taillight, turn signals and license plate lamp) on the Ninja H2 is now LED. 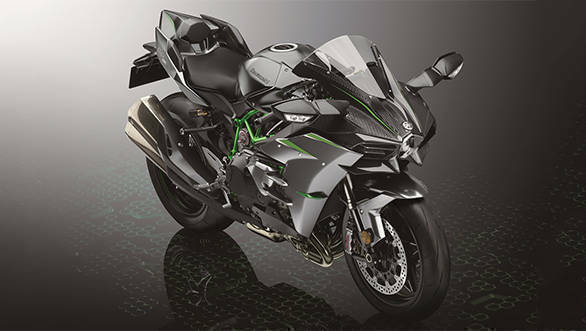 Further added Mr. Yamashita, "As we are opening the booking now, we would like our customers to take a note that Ninja H2 Carbon and Ninja H2R will be available in a very limited quantity. Ninja H2 Carbon is limited in numbers as it is strenuous production and in Ninja H2R is a very special product and will always be produced in limited quantity." As far as changes to MY19 Ninja H2R is concerned, it also now receives, Brembo's new Stylema monobloc calipers, the new "Supercharged" emblem and Kawasaki's Highly Durable paint. 19MY new Ninja H2's ex-showroom (Delhi) price is INR 34,50,000, while the price of Ninja H2 Carbon is INR 41,00,000. 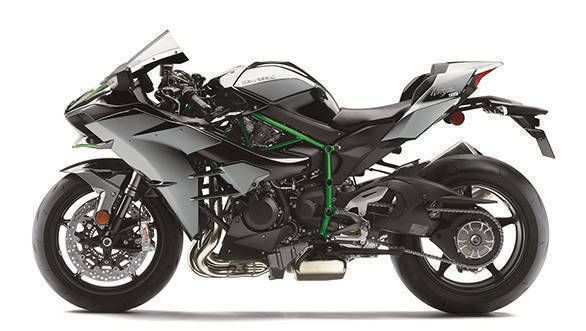 And the widely respected Ninja H2R will be available for 72,00,000 ex-showroom (Delhi). All these three models are CBU which are produced by selected high-skilled special engineers in Japan. The booking period will be start from 1st September 2018 and will be closed by 31st October 2018. The delivery to the customers will be done in next year. And for booking related queries customers can visit the nearest Kawasaki showroom.